I have lived in the Northwest for 11 years now, but the thing I have noticed is that there is always more Northwest just behind the Northwest I was just looking at, even for people like me who do not even remotely qualify as outdoorsy. (Although I did recently buy hiking boots and a raincoat, so there's that.) 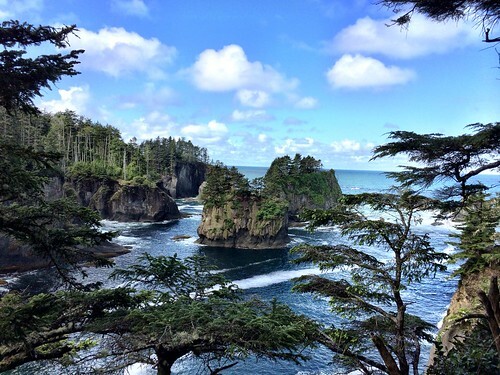 A couple of months ago we wandered over to Cape Flattery, the northwesternmost point in the continental US, which goes along with my vague notion of going to all of the most places that I can get to comfortably. Cape Flattery was named by Captain Cook in the year before he got himself killed because it flattered them with hopes of finding a harbor, which is not the least interesting way a Washington place was given its name. Anyway, there is a lot of this West Coast that I have not seen, so soon we're going to see a bunch of it--down the coast to California and up again by Crater Lake. Crater Lake is a most--it's the deepest lake in the US--and the redwoods are the tallest, so we're covering some significant Northwesterly ground. I don't love the woods like John Muir did, and I don't particularly wish to, but I do agree with him on a lot of counts and mainly this: "Everybody needs beauty as well as bread, places to play in and pray in, where Nature may heal and cheer and give strength to body and soul alike."